Before I forget, yesterday I left out the $11 BBQ Chicken I had bought a few days before. It has been picked clean with the meat frozen in portions, and the carcass used in stock. Anyway, today I managed to not get killed in a sudden hailstorm. This made me very happy. I was even happier when I got home and then got warm. The decision was made to make an apple crumble using some of the Apple and Quince pie filling I made a few months ago. Then I decided that I would use those beautiful pork sausages you saw me freeze a few weeks back. I had started making a hot pot with them, and had just added some fennel seeds, when I remembered that fennel bulb from the vegetable shopping. 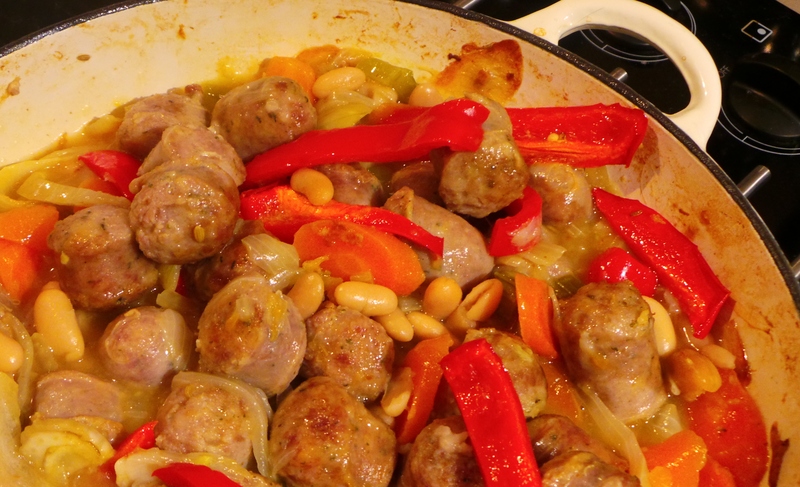 So, I made a WONDERFUL cassoulet-like dish with pork sausages, fresh fennel and cannellini beans. My goodness it was good. And I served it on a bed of mashed, slow-cooked sweet potato. Because I could. I’ve documented all the steps, so I shall be able to post a recipe for you soon-ish. It made enough for four, so we got a meal’s worth of leftovers from it – for this I am grateful. I didn’t make biscuits. That can wait until tomorrow. That’s it for tonight, Lovelies. Speak tomorrow.